People attend a march during a protest against the government of President Nicolas Maduro in San Cristobal, capital of the western border state of Tachira, Venezuela. 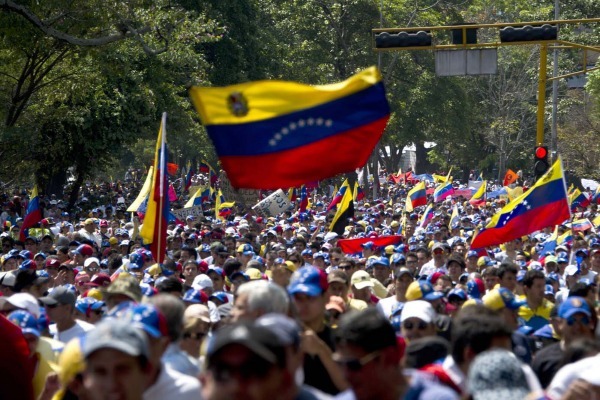 The Group of the Alliance of Liberals and Democrats for Europe (ALDE) in the European Parliament has welcomed the EU Foreign Affairs Council’s adoption of restrictive measures targeting Venezuelan officials. The sanctions consist of a legal framework for a travel ban and assets freeze of those involved in the non-respect of democratic principles or the rule of law and the violation of human rights. ALDE has been calling for the Council to consider targeted sanctions in Venezuela since 2014. She said the sanctions should help drive the regime to finally engage in real dialogue, but more must be done to obtain a peaceful transition. According to a European Council press release, the restrictive measures aim to help foster democratic shared solutions that can bring political stability to the country and allow it to address the pressing needs of the population.